With a heavy heart I write this. This is truly one of the saddest messages I have ever had to write. Today I was notified of the passing of a long time member of our Little League Family. Mike Galindo passed away today. He has been involved with Concord American since the early 90's as a Board Member and Manager. 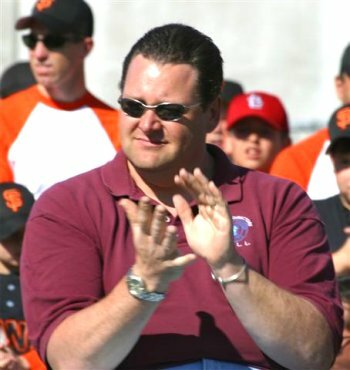 Mike was the current Vice President of Inter-league and Manager of the Junior Division Cardinals. As a coach he was the best. I loved to watch him encourage the kids on his teams from the third base coaching box. He was such a huge and positive influence for so many kids. The kids learned so well being motivated by his enthusiasm. As a Board Member, in Board meetings he was always the voice of calm reasoning and experience. But most of all he was a good friend to all of us that knew him, a great father to his three boy's Chris, Kevin and Cory and a loving husband to his wife Kim. I want to say so much about Mike but the shock of this sad news has made it hard for me to concentrate. I can't express how much Mike will be missed. I for one am a better person for having known him. This Season is Dedicated to the Memory of Mike Galindo, The Concord American Flag will fly at half mast in his honor. When details of the services are announced I will forward the information to all. For those of you who knew Mike and would like to share your memories of him, please do so and I will post them on this page. You can write to me at rockaway@astound.net.